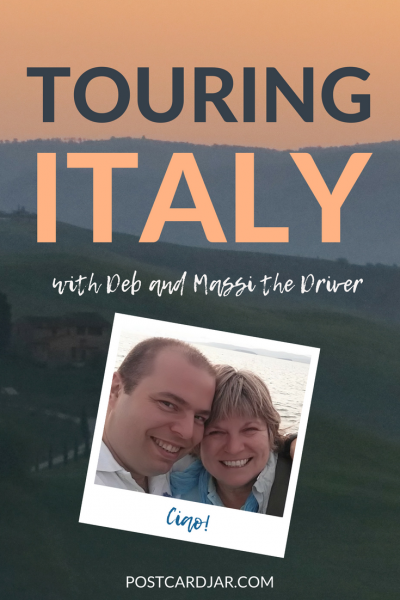 Yes, we’ve been invited to tour Italy with Deb and Massi. She’s from upstate New York, backpacked through Australia and New Zealand, and worked in Silicon Valley and in Texas. He’s small town boy who grew up on a Tuscan hunting estate and winery and took a job in a salumeria just 20 miles from his home. Somehow they met, fell in love, and were married in a bar-b-que line in Austin, Texas. 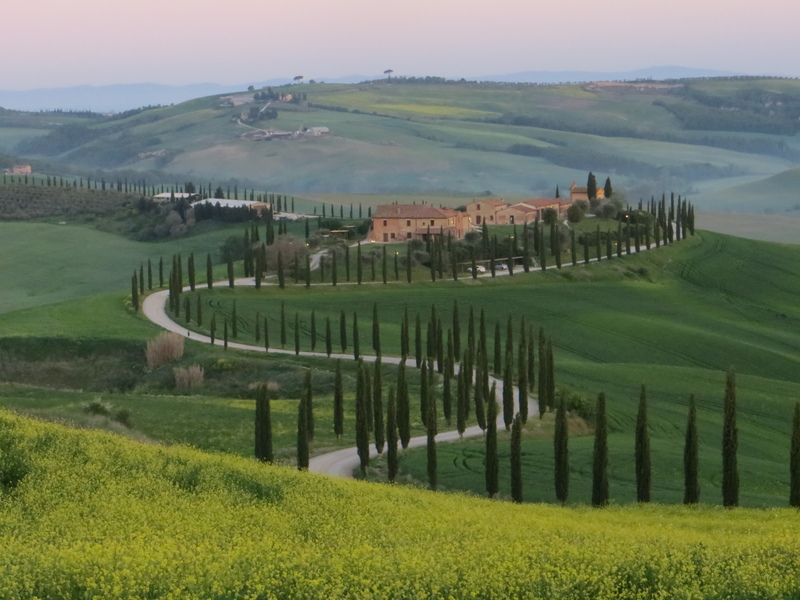 And this summer, we get to spend five days touring the Italian countryside with them. Sounds fantastic, doesn’t it? Massi and Deb, with whom we’ll be spending five days this summer. Three years ago, long before I’d even thought of leaving my career as a middle school principal, Ann and I booked a cruise on the Celebrity Reflection for this summer from Rome to Greece. Because the ship will whisk us away from Italy almost immediately, and now that I’ve got some flexibility since leaving my job, we thought it would be nice to see a little more of Italy before our cruise because, well, Italy. This should help answer any questions as to why we’d want to see Italy. 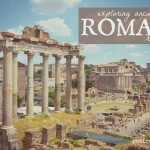 As the date for our trip came closer, we began making plans and asked a question in an Italian travel group on Facebook. Deb Larsen of Italy Unfiltered, responded by telling us that she and her husband, Massi, (Massi the Driver), would like to host us for some amazing experiences like winey visits and cooking classes, offering their services free of charge. 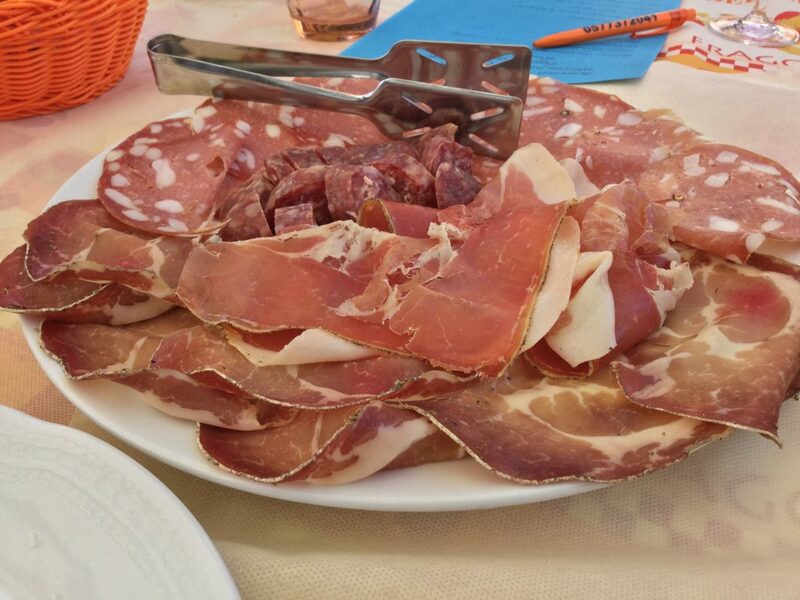 Now, if you think for one minute that the promise of fresh Italian meats, cheeses, pastas, and wines as well as beautiful views of the Italian countryside could lure us in, then you would be 100% correct. I mean, look at these pictures! We. Can’t. Wait! A beautiful Italian charcuterie board. Let me tell you a little bit about our hosts. Deb is a world traveler who isn’t afraid of adventure. After finishing culinary school in upstate New York, she caught the travel bug and backpacked around Australia and New Zealand using the skills she’d learned in school to support herself. After three years, she figured she’d better head back home, but didn’t have money for airfare, so she worked her way home on a container ship. A container ship! 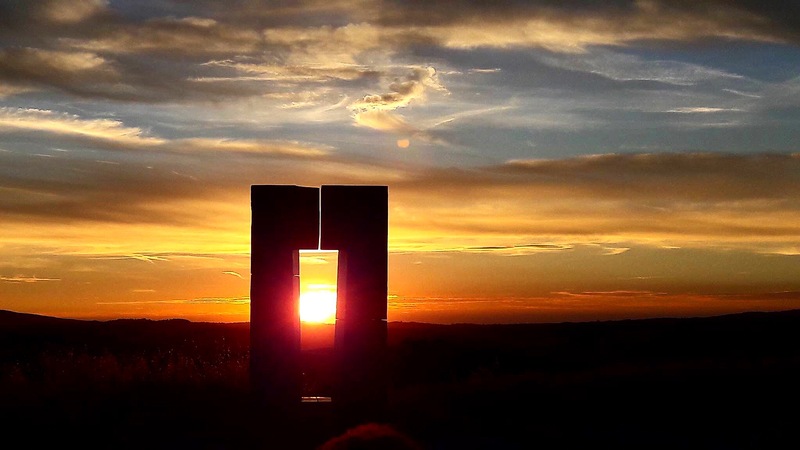 We would agree that this view seems pretty magical. So magical, it seems, that she stood crying in the airport in Milan when it was time to leave. Seriously. She was in tears. Just as soon as she was home, she began planning her next trip. One glance at this delicious looking plate tells us why people visit salumerias. That employee was Massi. He’d grown up just 20 miles away, on a Tuscan hunting estate and winery where his father had worked. By age 15, he was working at the winery. After high school, he spent some time working for an energy/recycling company and began doing some driving. Later, he took a job at a salumeria in Siena, a store that sold cured meats, cheeses, and wines. It was there he really began to learn about Italian wine and not just the stuff his dad had made in their garage. 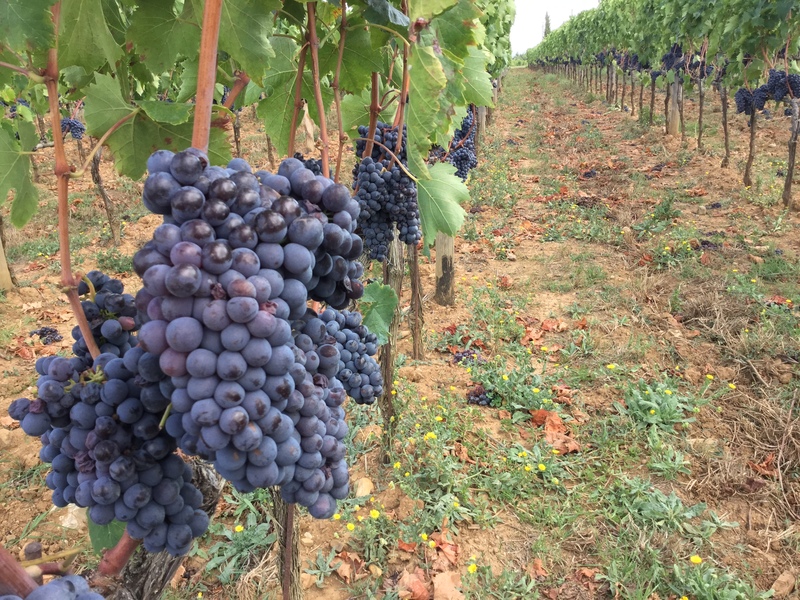 Grapes on the vine in Italy. He worked hard, and his employer soon rewarded him by taking him on tours of wineries. He took advantage of those opportunities and learned as much as he could. Massi even learned to open Prosecco in the traditional way: with a sword! Then he met Deb, and let her talk in her broken Italian even though he spoke English well. They exchanged emails. Then phone numbers. Then, they fell in love. Soon, friends in Austin were asking Deb to help them arrange trips to Tuscany. 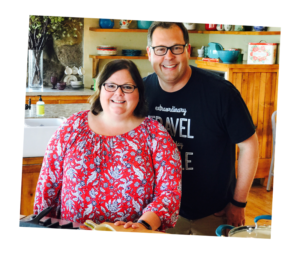 She worked with Massi to help create perfect, custom experiences for these people. One group led to another. Then repeat customers began to call. Suddenly, they were in business, even bringing an authentic Tuscan meal back to the states for a group of 14 people in California. They served it on a terrace, the ultimate in take-out dinners. 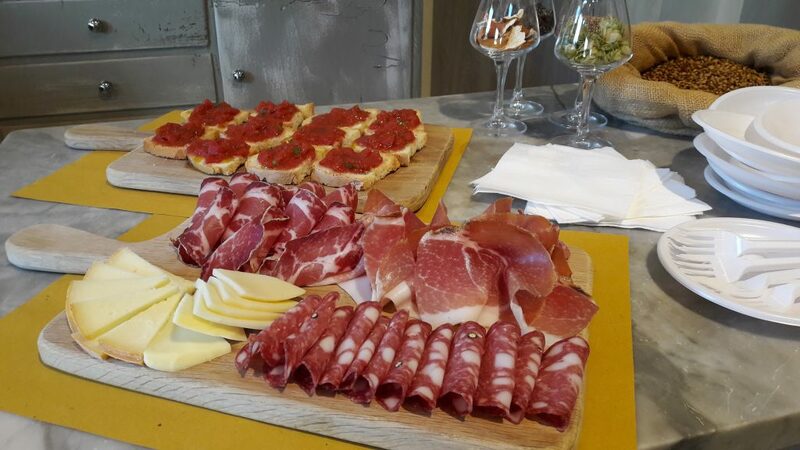 Italian meats and bruschetta ready to be served. 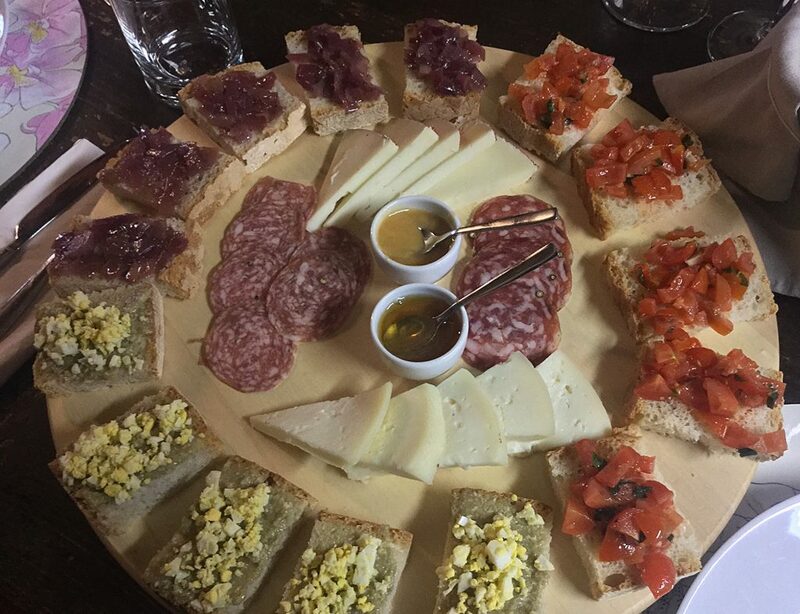 Is your mouth drooling yet, looking at these pictures of cured meats and cheeses? Back to our story. It was on a visit to the U.S. that they decided to get married. They considered Vegas or the courthouse, but those weren’t them. They did, however, love Franklin’s bar-b-que in Austin, Texas, where they’d waited in line together many times for the iconic barbecue. It was the perfect venue. 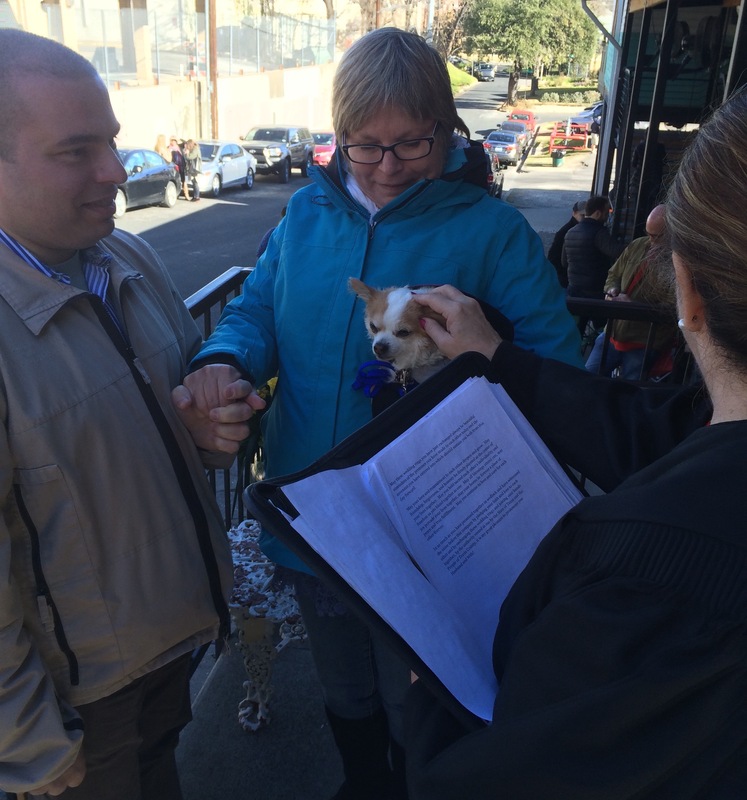 So, they decided to get married in the line that forms daily outside that Austin favorite. Wanting a small wedding, they invited one of Deb’s friends to be the witness and found a justice of the peace to join them in line. Even on their wedding day they had to wait in line, but the restaurant did give them a banana cream pie for a wedding cake. Oh, and their intimate wedding wound up featured on the local news. The couple left a wedding announcement at Franklin’s Bar-b-que. 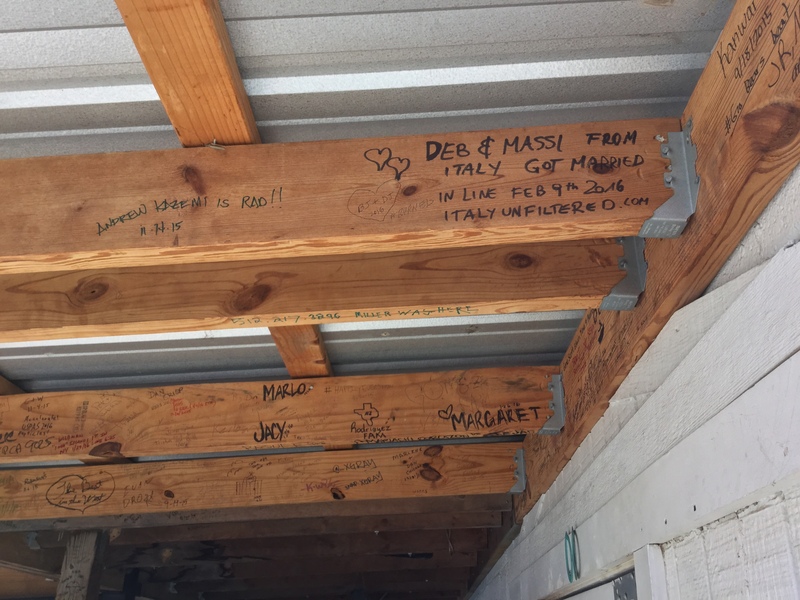 We’ve enjoyed getting to know Deb and Massi while preparing for our trip this summer. Planning travel to a foreign country where you don’t know anyone or even speak the language is a pretty daunting task. But working with this great couple has made things so much easier. Deb is from the U.S., so she understands where we’re coming from, and has been super-responsive to all our questions. Knowing we have her as a contact and helping with arrangements has taken away so much trip-planning stress. Massi is Italian, and knows all about the area, history, food, and wine. 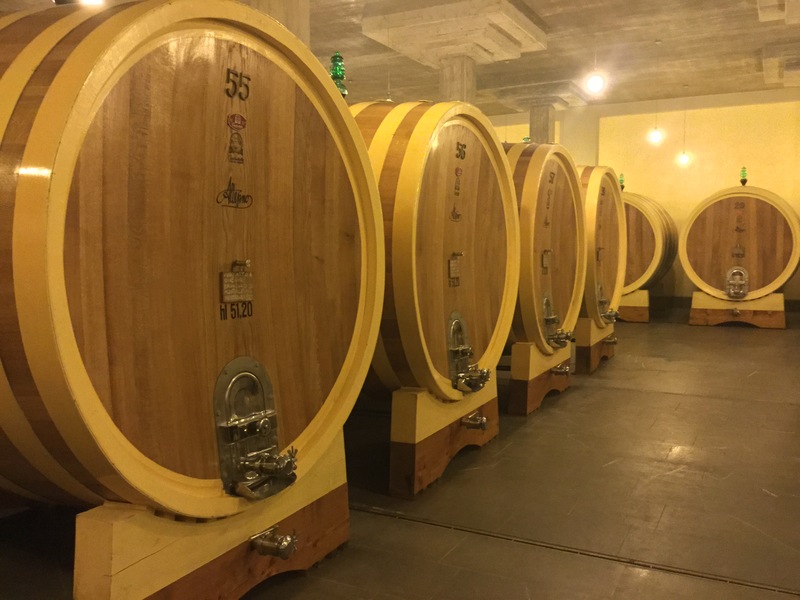 Wine ages in barrels at a winery in Montalcino. He knows all the locals and knows where to go to get the experiences their clients want. He’s also a fully licensed tour driver [CLICK HERE], meaning he can take his van to places a rental car isn’t allowed to go and many tourists will never see. 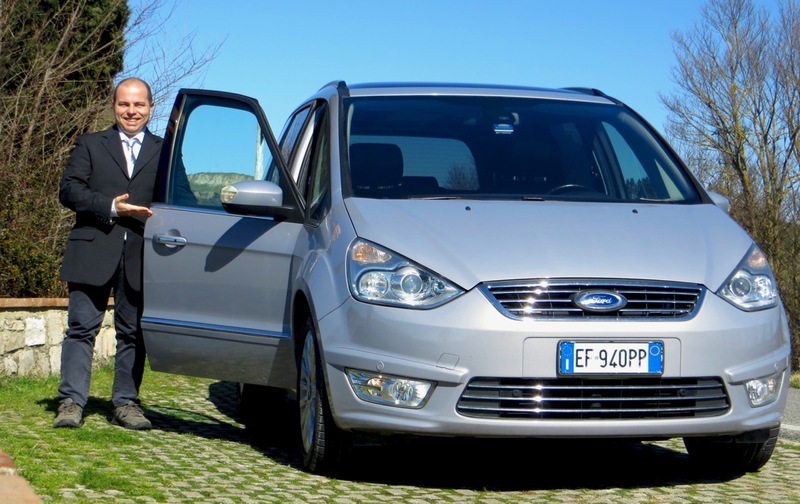 And let’s be honest, we’re excited to have a designated driver as we tour Italian wineries. Massi stands next to the van he drives for tours. Now in their third full year, their business is growing. They offer mostly private tours meaning we won’t be two of 50 crammed on a huge bus full of people, craning our necks, hoping to hear from the back of the crowd. Instead, we’re looking forward to a customized, personal experience built around our interests with ample opportunities to learn about Italian culture, history, food, and wine from real locals. And, after talking with Deb and Massi only a couple of times, we feel like we’ll be enjoying our experience with old friends. We can’t wait to begin our voyage, and share it with you. You can follow on our trip to Italy and all our journeys on social media on Facebook, Twitter, and Instagram. I mean, just look at this view. Ciao! All photos used in this post are courtesy of Italy Unfiltered. This will a great trip. And the food looks so good, can not wait for pictures! We are really looking forward to this one, Mary. We can’t wait to share the pictures, either!